More and more businesses are targeting customers through mobile devices today. The options range from building an engaging website, developing a native app or having a progressive web app. While websites are easy to use they lack outstanding experiences that most users seek. Native apps, however, excel at user experience but have adoption barriers and are selectively compatible with devices. There is also an extra need to download Native apps that lose the benefit of impulse behaviour when dealing with customers. Combining the bright side of both websites and native apps are progressive web apps. According to a Mobile Marketer report, Online retailer Luxmart doubled its mobile conversion rate to 1.24% from 0.6% after introducing a progressive web app (PWA). These web apps do everything a native app does but without any need for downloading and installation. They run in a web browser, loading instantly even in areas of low connectivity. A distinct convenience of the web app is that it stays updated all the time with the help of its pre-caching feature. Web apps don’t thrive on user’s precious memory or data, that again makes them an absolute favourite. Why Expand From a Native App to a Web App? To increase outreach to the audience that the native app isn’t catering to. To capture other use cases better suited for user experience, with perks of enhanced screen real estate. To allow your user a choice of more channels to reach your app. It is important to note that launching your native app on the web is not as simple as copying the existing app on to the web. A developer needs to work on new use cases and design aspect for the web version of a native app. Additionally, considerations like how the new web app will interact with the native app, changes in backend architecture and testing of the new web app against the many browsers, device, and operating system combinations that the user might use it with need planning. There will be times when your web and native use cases won’t match, and it is OKAY! Most businesses decide to launch their native app on the web to reach out to a new user base or offer conveniences of the bigger screen and lesser load times to its existing users. It is simple to conclude that the transition has ‘users’ at its heart. The developers need to come up with a web app that replicates the design feels of the existing native app but suits the needs of a user accessing it through the web. A general user survey and testing can help you decide which features of your native app need to copy onto the web app. This information will further help you make important decisions about the cross-platform experience, and backend architecture etc. When it comes to designing native apps and web apps, developers face different problems for each type of app. Not only web apps bring to the table more screen space, but the way a user accesses info on a web app also differs a great degree from native apps. No matter how similar both apps look visually, there are many design specific concerns that need to be addressed when you are launching a native app on the web. For example, the extra screen space available on web app opens up opportunities to play with features, visual element addition, elaborate content and what not. The second major difference in a web app and a native app is the need to ‘click’ on icons and not ‘tap.’ Many different types of taps, presses, swipes and pinches make up the native app user experience for a user. Things are radically different in web apps and are sorted with simple clicking. Native apps promise a seamless, intuitive experience to users with prompt responses to their actions. Developers often face difficulty in recreating similar experiences in web apps as they have to deal with extra hardware, browsers and related elements. Users face a web app screen for the longer duration of time than native apps. This creates a need for use of proper colours and font size to increase engagement time and avoid strain to eyes. An ideal case scenario would be to choose a custom font that works well for all platforms. To encourage simultaneous usage of both the native app and web app, a developer needs to make seamless transition his/her priority. For a consistent user experience throughout platforms, make sure you match up visual language, element hierarchy, brand indicators and the order of placement of features on the app. It is imperative to define the kind of experience you want your user to enjoy on each platform. What if a user accesses a web app through his/her mobile? Will he be asked to download the native app? Or will he be offered the app experience in all its glory on the web? Additionally, mobile app developers need to think of ways to lure the existing native user into trying out your web app. Targeted in-app promotions like ad banners, push notifications and messages are an effective way to do this. Paid promotion strategies like social media, email and adverts are also a reliable way to reach out to potential users. Expanding from a native app to a web app is tempting but comes with its own set of challenges for backend support. Even if you have thriving backend architecture for your native app, you will have to find solutions to the strain that this expansion would cause. 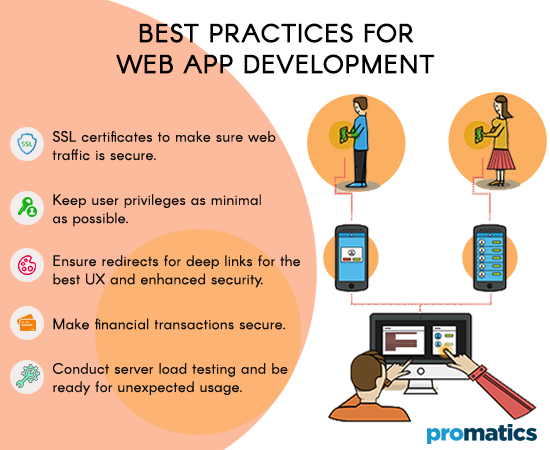 As a developer, you will have to provide for storage of new records, encryption and security, tackle server load and take care of scaling your resources. Identifying and resolving any security vulnerabilities during development is a must do. Hosting a web app may also get expensive with a drastic increase in user base. a.) SSL certificates to make sure web traffic is secure. b.) Keep user privileges as minimal as possible. c.) Ensure redirects for deep links for the best user experience and enhanced security. d.) Make financial transactions secure. e.) Conduct server load testing and be ready for unexpected usage. Transitioning from just a native app to a web app can bring vivid surprises for your business. However, this seemingly easy task requires massive planning on the development front. A developer considers all new use cases for a web app and designs differently for them. A business has to decide how it wants its users to interact with both apps. It is then a developers job to determine how to make that transition as seamless and intuitive as possible. Not only the compatibility concerns, but expansion into a web app also puts a strain on your backend architecture. 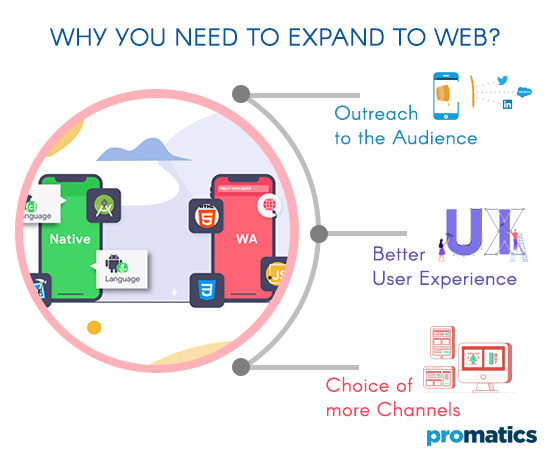 Even in the face of all these challenges, our team at Promatics has vouched how launching a native app on the web is a prolific way to reach out to new users, do more for your existing users and expand your business. These apps don’t need a separate code base and can easily function within the existing browser that a user is using. We can claim without bias that is the best quality cost-effective solution for businesses. The inherent flexibility of web apps makes them the preferred choice of businesses which to stay ahead of the curve in the mobile industry. If you are an app business who wants to explore the world of the web, we are just a call away. With an ability to learn and apply, passion for coding and development, Gagandeep Sethi has made his way from a trainee to Tech Lead at Promatics. He stands at the forefront of the fatest moving technology industry trend: hybrid mobility solutions. 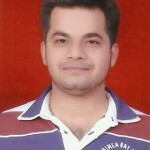 He has good understanding of analyzing technical needs of clients and proposing the best solutions. Having demonstrated experience in building hybroid apps using Phonegap and Ionic, his work is well appreciated by his clients. Gagandeep holds master’s degree in Computer Application. When he is not at work, he loves to listen to music and hang out with friends.